Everyone knows bigger is better, especially when it comes to computer displays. It doesn’t matter if you want to connect a laptop to a TV or a desktop computer to an external monitor, as long as you have the proper cables - you should be up and running in minutes. Read on to learn exactly how you can use a TV as a computer monitor! The first step in connecting your computer to your TV is to look at both your computer outputs and display inputs. They will be located on the back of each device. Doing this will show you what cables you’ll need to connect your two devices. Most, if not all, newer televisions and monitors will come equipped with at least one HDMI input. Older models will have DVI or VGA inputs. 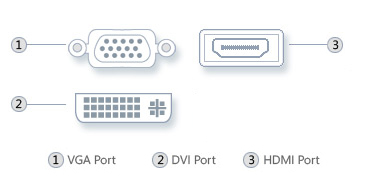 Each input should be properly labeled on the display, but if it isn’t, see below for a list of the different types of display ports. Likewise, newer computers will most likely be equipped with an HDMI output. Older computers will most likely have DVI or VGA outputs. 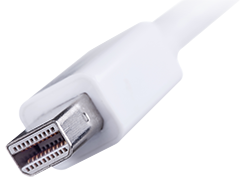 If you have an Apple computer or laptop you may have a mini displayport or thunderbolt. 2. What Kind of Display Ports Do I Need? One of the most important facts that you need to know is that HDMI and mini displayports are the only cables that support both video and sound. All other cables discussed in this article only support video. If you want sound then you will have either use an auxiliary cable or optical cord if you devices support it. The sound will still work from the original device if no cable in connected to the display. It is also important to remember that only a HDMI and DVI cable will support high definition. A VGA cable will not support HD content. Now that you know what inputs and outputs your devices support, you will need to determine which cables to purchase. If you know both your computer and external monitor have HDMI ports then all you need is an HDMI cable. Otherwise, this can get quite tricky because if your two devices do not have matching ports then you will have to use an adapter. 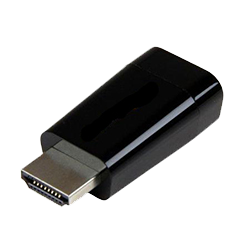 For instance, if your TV only has HDMI ports and your computer only has a VGA output, then you will have to purchase a VGA-to-HDMI adapter or cable to connect the two. Make sure that the female and male cable ends match up correctly before purchasing or you will not be able to make the connections properly. If you are not sure the difference between male and female cable ends, you will will be able to see the metal prongs with a male connection. The female will have holes on the inside. In other words, the "female" connector is generally a receptacle that receives and holds the "male" connector. You can find adapters and cables at your local electronics store. You’ll also want to make sure that the cord length is long enough to reach your external display. If you have a standing workstation or any other type of TV stand with cable management, make sure to have an extra foot or two. Once you have bought the correct cables and adapters you are ready to connect your computer to the larger display screen! With advancements in technology, computers can now automatically find the external monitor source in most cases. This goes for the external monitor as well - it will identify find the computer’s input. Make sure to have the display set to the same input as the port you are using to make your connecton. If the computer and monitor do not automatically detect each other then follow the steps below. Before doing so make sure that both connections are properly connected. Sometimes it also helps to restart the computer. From Desktop right click desktop background and click screen resolution. 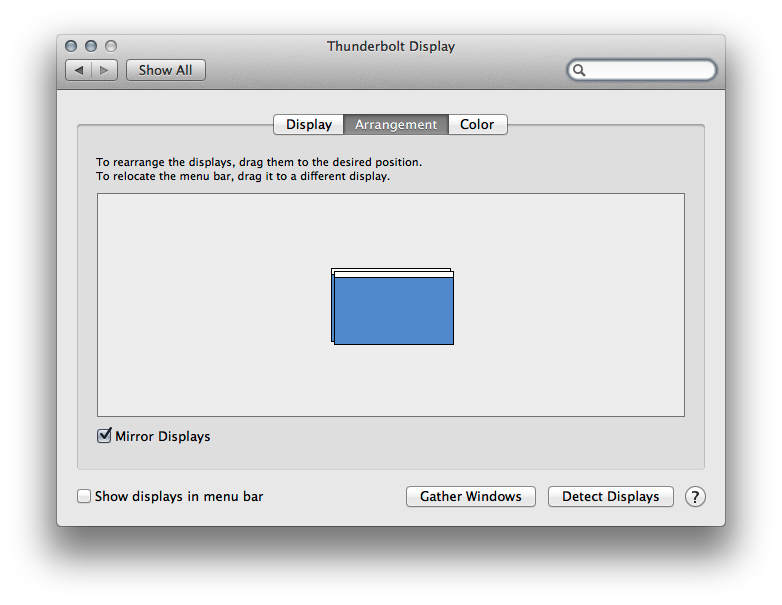 Next to multiple displays click extend desktop to this display. If your text or screen size seems too small or large simply change the screen resolution in the display settings. The key sequence can vary depending on the laptop; however, is often either: Fn + F3, F4, F5, F7, F8, or F9. For example, pressing and holding Fn + F7 at the same time could switch between your laptop and external display. From the Apple (apple icon) menu, choose System Preferences. Enable (check) “Mirror Displays” in the bottom-left corner. 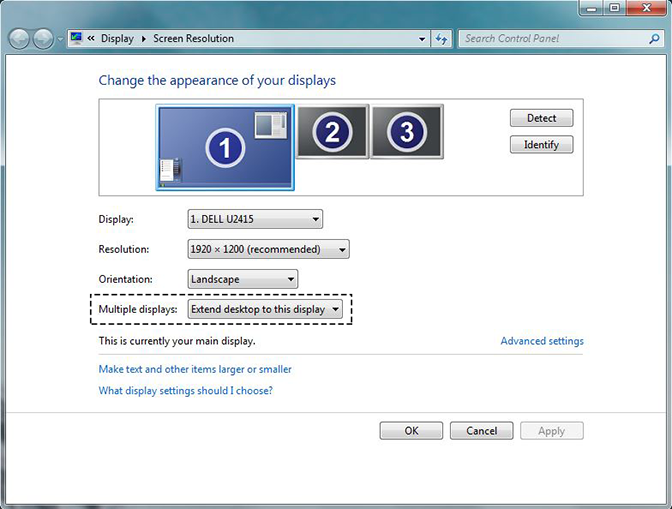 Disable (uncheck) “Mirror Displays” in the bottom-left corner to enable extending the screen so that both screens show as one large desktop. To Change the Resolution click the Display tab. Now that you know how to hook your computer up with your TV screen, you can stream netflix on a big screen, check your email from the comfort of your couch, or even play some video games! If you are interested in showing images and video from your computer without the hassel of connecting the two, then you might be interested in our mini media player. 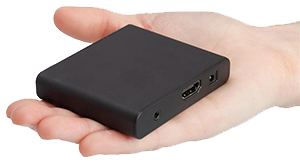 This HD media player connects to a TV and is only 3" wide. This device easily lets you upload your favorite images, videos, and audio files then simply plug-and-play.